We are lucky to get occasional visits by bullfinches in our garden, with the stunningly coloured males. Indeed their Latin name Pyrrhula pyrrhula would appear to have its origins with the Greek word ‘pyrros’, meaning ‘the colour of fire’, which certainly is in keeping with the male Bullfinch’s flame coloured breast. Presumably this is where the word pyromaniac comes from. Our bullfinches usually visit as a pair feeding on the buds and berries in the garden. However I have noticed them also occasionally feeding on nettle seeds. I always assumed with their largish beaks that they were better adapted to larger food items rather than small seeds. Indeed it is their propensity to eat the flower buds of fruit trees that has not always made them popular with gardeners and commercial fruit growers. 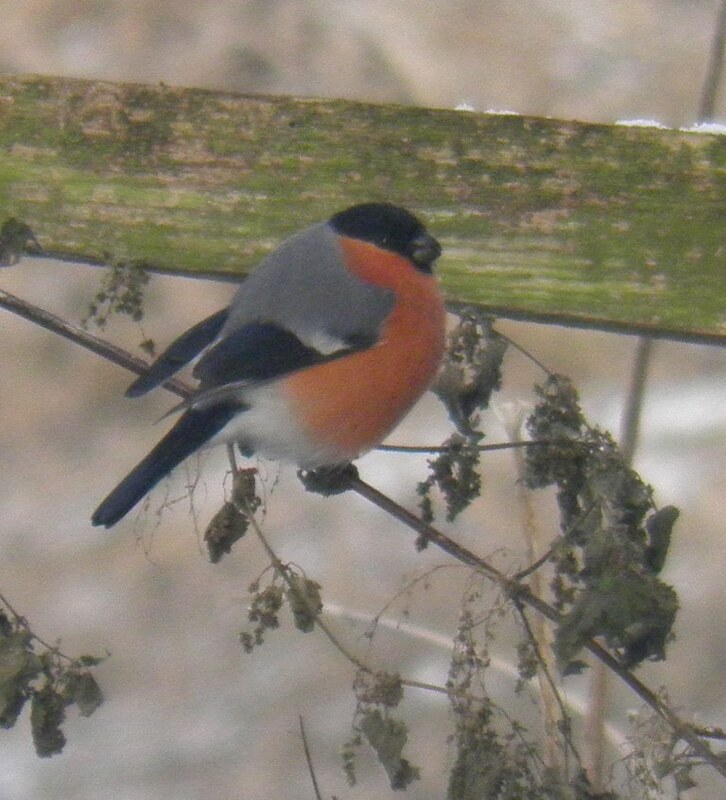 According to Newton (1967) the key factor in determining what proportion buds were included in their diet was the size of the ash (Fraxinus excelsior) crop, such that when it was poor, the bullfinches resorted to buds much earlier causing greater damage. He did also emphasise that the seeds of the nettle (Urtica dioica) are important in their diet, along with those of Dog’s Mercury (Mercurialis perennis), Bramble, Garlic Mustard (Alliaria petiolata), Dandelion (Taraxacum officinale agg) and Common Chickweed (Stellaria media). Breeding birds develop special pouches situated beneath their lower jaw which acts as a temporary storage chamber to collect food for their young (Newton, 1967). According to some websites nettle seeds can provide humans with quite a medicinal punch to treat various ailments, concentrating ingredients found in the leaves. Whether this ‘flame-boyant’ bird gets such a kick, it is of course impossible to say, but they certainly seem to enjoy them. Maybe I should give them a try!